In August Army Group North had two primary objectives. Firstly, to breach the Luga defence line, isolate and then hopefully capture Leningrad with the 18th Army, and secondly to advance 16th Army eastwards into the Valdai Hills and capture Demyansk. The Germans planned to break the Luga line with three attacks. The 41st Panzer Corps was to attack northwards from the Kingisepp bridgehead, the 56th Panzer Corps would attack north-eastwards from Luga, and 1st and 28th Infantry Corps would attack (the Soviet 48th Army) northwards parallel to the Volkhov River. The 39th Panzer Corps from Army Group Centre was still in the early stages of relocating to the Luga area: it would have to move from the Yartsevo area (over 280 miles away) and would not be available until 24th August. This is especially paradoxical when one considers that the 39th Panzer Corps was being ordered to move mostly using its own motorised transport on poor roads while Moscow was only around 220 miles away on better roads! The Germans launched their attack along the Luga line on the 8th and 9th of August, while 16th Army attacked south of Lake Ilmen on 10th August. All along the front the fighting was fierce and only 41st Panzer Corps (at Kingisepp) made much progress. By 14th August the Kingisepp bridgehead (defences) had started to collapse, by 16th August 41st Panzer Corps had broken out, and on 17th August Narva was captured. By 20th August 41st Panzer Corps (now reinforced with the 8th Panzer Division) and 18th Army had isolated the main elements of the Soviet’s Luga Operational Group and trapped 30 000 men. The remnants of the Luga Operational Group contained 9 divisions (including a tank division): the fact that the average division was down to regimental strength (around 3 300 men each) is an indication of the fierce fighting in this sector, the tenacity of the Soviet defenders, and the speed with which the German Army could wear down even a dug in enemy force. On 13th August the 56th Panzer Corps (now with only two motorised divisions) was ordered to disengage at Luga and assist 10th Corps by moving south-west and attacking the Soviet 34th Army. However the imperilled 10th Infantry Corps had to hold on because 56th Panzer Corps was already heavily engaged and could not disengage and relocate until 18th August. On 19th August 56th Panzer Corps’ attack caught the 34th Army in the flank and by surprise. The 34th Army was badly damaged and attempted to withdraw. By 22nd August the 56th Panzer Corps reached the Lovat river having captured 12 000 men from the retreating 34th Army. While fighting 16th Army and 56th Panzer Corps from 10th August to 1st September, the Soviet 11th, 27th and 34th Armies sustained 128 550 casualties and lost 481 tanks. In late August the 16th Army and 56th Panzer Corps pushed deeper into the Valdai Hills. In early September they linked up with the 57th Panzer Corps, as Army Group Centre’s left wing drove north, and supported its capture of Demyansk on 7th September. On 24th August the 41st Panzer Corps and 18th Army had started ‘probing’ the heavily fortified line through Krasnogvardievsk, only 20 miles from Leningrad. By this time the 39th Panzer Corps had arrived from Army Group Centre and its orders were to isolate Leningrad from the south-east while 41st Panzer Corps attacked the city’s defences from the south-west. On 25th and 26th August the two panzer corps attacked, and the with the deepening crisis the (Soviet) GKO assigned the newly mobilised 4th, 52nd and 54th Armies along and east of the Volkhov River. The Stavka also approved the formation of two new Armies: the 42nd and 55th, which would defend Leningrad itself. 39th Panzer Corps soon captured Lyuban and closed up to the Neva River, while 4th Panzer Group and 18th Army put pressure on the shrinking line around Leningrad and the Oranienbaum region. From 30th August to 1st September, 39th Panzer Corps captured Mga and severed the last rail link to Leningrad. By 8th September 39th Panzer Corps and 28th Infantry Corps captured Schlusselberg on the south coast of Lake Ladoga, thereby cutting the last land route out of Leningrad. Shortly after, Army Group North began its assault on Leningrad with 41st Panzer Corps and 18th Army capturing Krasnoye Selo and threatening Leningrad from the east. In the meantime the Soviet 54th Army launched a series of ferocious attacks towards Schlusselberg and Sinyavino in an effort to break through to 55th Army in Leningrad, but to no avail. By this time however the German Fuhrer had changed his mind again. Having moved a significant proportion of Army Group Centre’s offensive capability all the way to Leningrad, he now decided (from 6th-12th September) that Army Group North should not actually take the city but starve it into submission. Accordingly, Leeb was now ordered to hand over all his armoured units to Army Group Centre, except the 39th Panzer Corps (with 1 panzer and 2 motorised divisions). From 13th to 19th September the 18th Army continued to push the Soviet perimeter inwards, finally isolating the Soviet 8th Army in the Oranienbaum pocket (against the Gulf of Finland). During this period the 41st, 56th and 57th Panzer Corps, and the HQ of 4th Panzer Group moved southwards to redeploy for Operation Typhoon. This removed any chance 18th Army had of storming the city in 1941 because the remaining 39th Panzer Corps was destined for operations east of the Volkhov River. 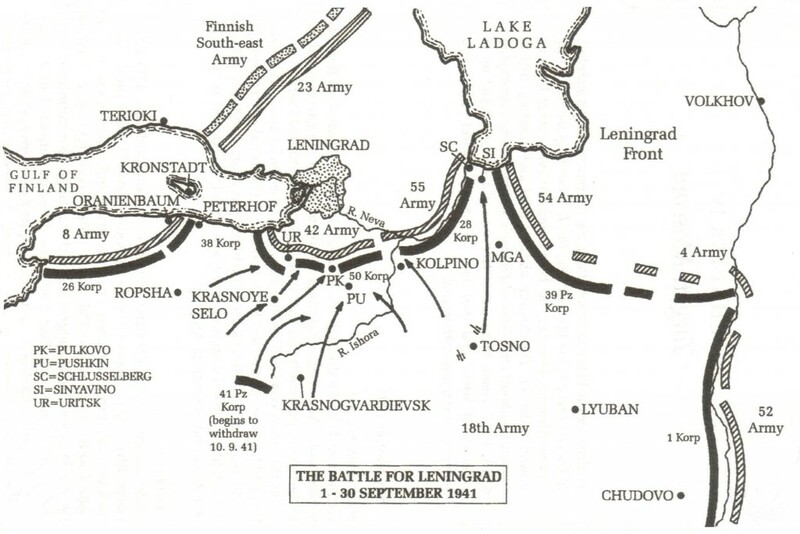 For the remainder of September the Leningrad sector remained fairly quiet and 18th Army settled into besieging the city whilst preparing to repel any relief attempts. Apart from the battles around Leningrad and south of Lake Ilmen, Army Group North was also involved in two other notable operations in August and September 1941. These involved capturing Tallinn and Operation Beowulf. In early August 1941, 18th Army’s 26th Infantry Corps laid siege to the port city of Tallinn (capital of Estonia). In mid August the 42nd Infantry Corps arrived (initially in OKH reserves and then 9th Army) with 3 infantry divisions, while 26th Corps headed eastwards to Narva. By this time the Soviet 10th Rifle Corps defending Tallinn had 3 rifle divisions reinforced with several naval infantry brigades and other units (around 50 000) personnel. The main German offensive to capture the city commenced on 19th August. The fighting was fierce; it took the Germans four days to overcome the first defensive line and by 24th August the German infantry had got to within six miles of the city. From 25th-26th August there was fighting in the city streets, and the Soviets decided to evacuate the defending force by sea. This commenced on 27th August with around 30 000 Soviet troops evacuated, and the city falling on the 28th. However around 11 400 soldiers were left behind and captured, and the evacuation proved to be rather disastrous. This was because the Baltic Red Banner Fleet still controlled the sea area but not the airspace above it. From two great convoys of 84 and 78 ships which conducted the evacuation, 5 destroyers and 41 other ships were sunk by enemy aircraft and minefields. Even worse, around half of the evacuated personnel were lost. Operation Beowulf was the German amphibious invasion of the main Baltic islands of Oesel (also called Saaremaa) and Dago (also called Hiiumaa). These islands (along with the Hango peninsula in Finland) controlled naval movement into and out of the Gulf of Riga and the Gulf of Finland. The islands were garrisoned by 23 700 men of the 3rd Rifle Brigade and support units (originally assigned to 27th Army), and had been heavily fortified. Operation Beowulf involved the 61st Infantry Division, several combat pionier units, about 100 ships and barges, and 180 small assault boats. From 8th to 14th September the Germans landed on the island of Vormsi (adjacent to Hiiumaa), and Saaremaa and Muhu. By 5th October all three islands had been cleared. On 12th October elements of the 61st Infantry Division landed on Hiiumaa and had cleared the island by 21st October. Soviet losses amounted to approximately 19 000 captured and 4 700 killed (the entire garrison). German killed, wounded and missing amounted to 2 850. While Army Group North approached Leningrad from the south and east, the Finnish Army continued to fight over territory lost in the Winter War. On 6th August the Karelia Army (on the Karelian Isthmus) achieved a breakthrough against the Soviet 23rd Army defending Leningrad. The Finnish 2nd and 4th Corps pushed on to Lake Ladoga near Khitola, isolating elements of 23rd Army north of the lake. In this sector the Finns now formed the 1st Corps with three divisions to assist 4th Corps and destroy the isolated Soviet divisions (parts of two were trapped at Kexholm and one at Sortavala). By 23rd August the 1st Corps had cleared the area north of Lake Ladoga, but the bulk of Soviet forces had already been evacuated by boat across the lake. Meanwhile 2nd and 4th Corps progressed down the Karelian Isthmus and threatened the rear of 23rd Army, so that by 20th August 23rd Army was ordered to withdraw to a shorter line between Lake Pukya and Vuoksa. 4th Corps kept up the pressure and on 24th August crossed the Gulf of Vyborg (with its 8th Infantry Division) which threatened to isolate three Soviet divisions in Vyborg. By 26th August the 4th Corps reached the Vuoksi River, seven miles from Viipurii. 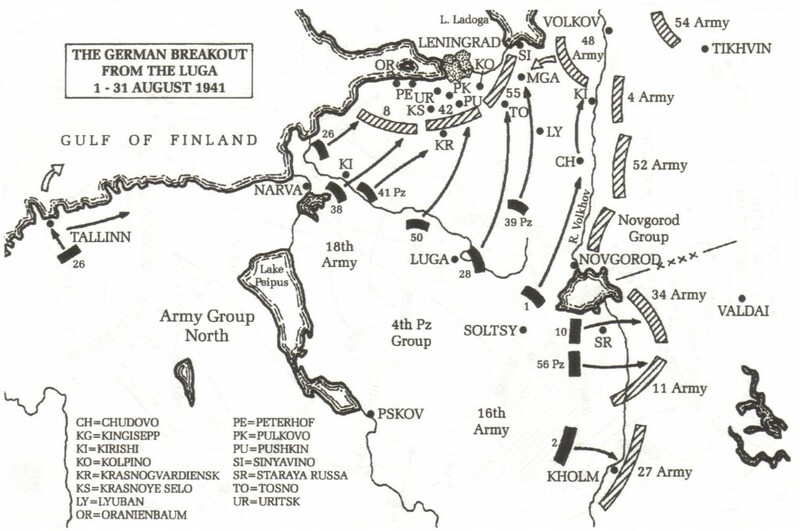 The Soviet 23rd Army was subsequently ordered to pull back to the Mannerheim Line and Viipurii fell on 29th August, although a Soviet counter-attack ensured the ‘trapped’ divisions managed to escape. By 1st September the 23rd Army was pulling back to the 1939 Soviet-Finnish border which was on Mannerheim’s ‘stop line’. By this rime the situation in northern part of the Soviet-Finnish border had become serious enough for the Soviets to form the new Karelian Front controlling the 7th Army in North Karelia, and 14th Army defending Murmansk and the Kola Peninsula. The front took up blocking positions eastwards and south-eastwards between Lake Ladoga and Onega. On 3rd September the Karelia Army (north of Lake Ladoga) attacked again with nine divisions, and on 5th September Olonets fell as the 7th Army started falling back to the Svir River. On 8th September Finnish forces captured Lodenoye Pole, severing the Murmansk railway across the Svir River. From 12th September the Finns launched limited attacks across the Svir River but had now reached Mannerheim’s ‘stop line’ in the south. The Finnish forces in the south were now content to sit on the old Soviet-Finish border and the Svir River line, and made no attempts to assist 18th Army to further isolate or take Leningrad.